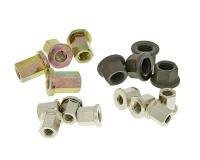 Below you will find a list of Naraku special nut sets with various thread sizes for use for engine cylinder heads. The nut sets can be used on Naraku Scooter Part Sets or on any brand. Please measure before ordering the size is described in each unit from M6, M7, M8, M10, etc. Each package is a set of 4 that can also be used for other purposes. Racing Planet USA has the largest selection of Naraku Performance Scooter Parts available. Naraku is one of our top tier brands with our highest recommendation. They have an excellent price range, model selection, and the highest quality. For all your Naraku needs make sure to select Racing Planet USA.